chief writer, introduced a number of minor characters to comicdom, including Super Katt, John Force, Fighting Yank and The Black Terror. His best-remembered creation is one that just sort of snuck up on him, Herbie Popnecker. Herbie first appeared in the 73rd issue (December, 1958) of Forbidden Worlds, a sci-fi/fantasy/horror title that had never before featured continuing characters. "Herbie's Quiet Saturday Afternoon" was a typical ACG story, about a character despised by his peers (in this case, because he was a very fat and slow-moving little boy, and overly addicted to lollipops), but who has hidden depths. Unknown to family and schoolmates alike, Herbie had vast, undefined, and unexplained super powers, which he used several times in the story, including foiling an alien invasion before anyone else even became aware of it. By story's end, like Michigan J. Frog, he shed all signs of the extraordinary, and resumed his patient endurance of the constant taunts and barbs. The artist was Ogden Whitney (Skyman, The Hooded Horseman). His illustration was understated almost to the point of blandness, but often showed flashes of subtle, sometimes sly humor. He proved perfectly suited to Herbie (who, by the way, is said to have been based on Whitney's own appearance as a boy), depicting the "Little Fat Nothing" (as Herbie's father, Pincus Popnecker, often called him) as a profoundly dull slug, yet able to make the character work in action scenes. The story got good response, and a new "Herbie" story, cast in the same mold, appeared 21 issues later. 16 issues after that, a third story explored his world and personality a little more fully, and soon he was appearing in every other issue, with his name above the magazine's logo. With a May, 1964 cover date, he graduated to his own regularly-published title. "Herbie" stories could take place in a wide variety of genre settings, including westerns, pirate stories, sci-fi and mysteries. He even became a superhero — despite having flunked out of superhero school, he donned his costume (red woolen underwear like Super Goof's or Forbush Man's, but adding a toilet plunger for a hat) every other issue, starting in 1965, to fight crime as The Fat Fury. He even adopted the superhero schtick of fighting other superheroes — Nemesis and Magicman, ACG's other costumed characters, guest starred in the 14th issue (January, 1966). 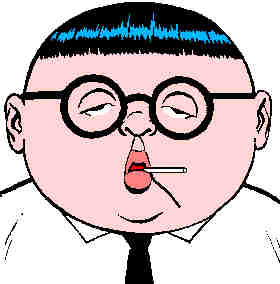 Although the comic was a modest commercial success, health problems forced Hughes to cut down on his comic book work. The title was retired with its 23rd issue (February, 1967). Later that year, the company itself folded. Hughes went to work as a scripter for DC, where he wrote Hawkman, among other features. Ogden Whitney freelanced for Marvel, where he drew The Two-Gun Kid and a few other second-string characters, and for Tower Comics, where he drew various T.H.U.N.D.E.R. Agents. Both retired from comics a few years later, and are now dead. Herbie is the subject of an occasional attempt at revival. But like the character himself, these attempts appear dull and lacking in energy — even one by the indescribable Bob Burden, in which the Little Fat Nothing met Flaming Carrot. Nobody else has ever successfully captured the feel of a Hughes/Whitney Herbie story, and it seems unlikely anyone ever will. Text ©2000-08 Donald D. Markstein. Art © Roger Broughton.